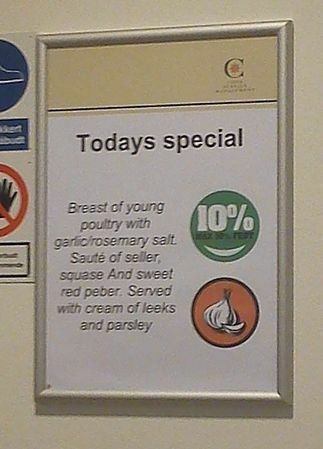 The latest instalment in our canteen’s crazy signs is here. It’s not for the weak of heart or sane of mind, so turn away now if your mental health is important to you. Nevermind the fact that they’re suspiciously vague about which poultry is being served. Does it come with “meat soup” and “liquid juice”? But it seems like they also murdered the guy who sold them the poultry and sautéed him! I’m quite sure that should be illegal, although I’m not a lawyer, so don’t take my word for it. There’s a few positives. The special appears to be 10% off, or something, the pebers are sweet, and the seller is sauteed, which is healthier than fried. I wouldn’t touch that bird. I have a breast of young poultry splattered on my window from where it crash landed earlier today. May I suggest a bag lunch from home? @BakedAlaskaInOr Sounds like a wise suggestion! It says “Max 10% fat”, so there’s always that 😉 Young poultry are trouble, that’s what I always say!